Western culture has always had a special place in its heart for motorcycles. There's just something delightfully rogueish about both the vehicles and the people who own them. 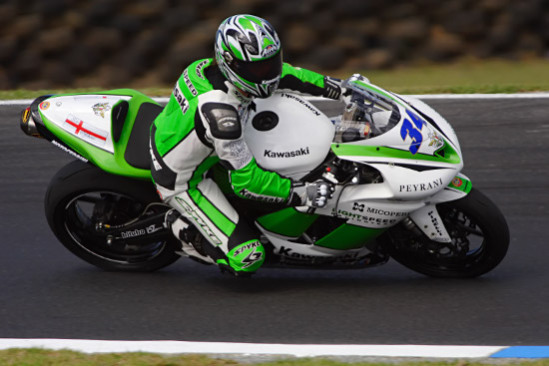 Perhaps that's connected to the inherent danger involved in riding one - you're considerably more likely to be injured in a motorcycle accident as opposed to a car accident. As such, you want to keep your wits about you - and your eyes on the road - at all times. Distracted driving when you're in a car is a risky business, at beast. On a bike, there's a good chance it'll be fatal. One of the biggest distractions you're likely to run into on a bike actually involves the bike itself. While I'm certain veteran riders can feel out their bike's engine revs and gear shift information and know their speed with a glance; novices are likely going to have to look down at their bike to get things straight. When you're riding a vehicle less than half the size of virtually everything else on the road, that isn't something you want to be doing. Even looking away for a second could have you eating a faceful of steel, asphalt, or both. A new startup is looking to take some of the danger away from biking. 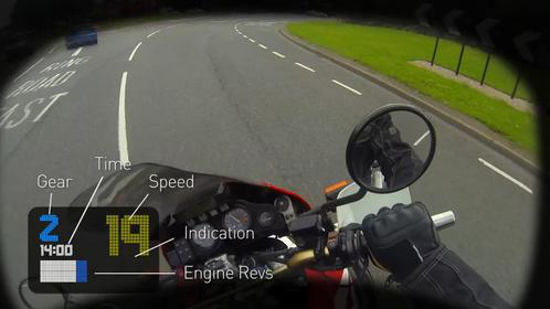 Known as Bike Systems, they've developed a helmet-mounted heads-up display known (rather fittingly) as the Bike HUD. This gadget consists of three components: an on-board computer, a handle-mounted control panel; and the display unit itself. "In our experience," reads the product description on crowd-funding platform Seedr, "the need to check behind in rear-view mirrors and check instrumentation means that motorcyclists may only spend one third of their attention on the road ahead. With Bike HUD there is the potential to significantly increase the time spent focused on the road." The on-board computer (which Bike Systems explains is about the size of an iPhone) is designed to work with any bike that contains a 12V electrical circuit. Once it's plugged in and the control panel is set up, the driver can use it to configure MP3 audio, GPS mapping, and radio; all this is ported through the helmet-mounted display unit. The basic device pipes a whole array of information through to the helmet's HUD, including road angle indicators, speed, gear, and revs; all this information is displayed to the driver without distracting them from the road. Further, the HUD is designed to be modular and customizable. Bike Systems is currently developing an array of add-ons for the device, including a rider-passenger intercom, In-Case-Of-Emergency monitoring, smartphone plug in and charge points, and more. I'd imagine at least one of those add-ons might feature mountable cameras that eliminate the need for the rider to perform back or shoulder-checks. I doubt you'll find many people who'll argue that riding a motorcycle isn't more dangerous than driving a car. The potential for injury in the event of an accident is far, far higher; looking away from the road for even a second (even if it's just to check one's speed or current gear) can have catastrophic results. Bike Systems is looking to change that with the Bike HUD, which will make biking just a little bit safer for everyone involved. Those of you interested in offering your support for the project (or ordering a Bike HUD for yourself) can visit the Bike Systems website. Inventor's 'Bedbug Detective' Sniffs Just Like A Dog! Thanks for the write up about Bike HUD. If any Inventor Spot readers have questions of comments, please get in touch with us, we'll be happy to answer them.